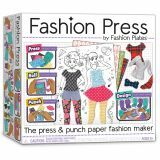 Press and punch out your own clothing designs on any patterned or solid color paper with tracing or cutting! Mix and match your designs on model sheets for endless fashion creations. You can even make ugly Christmas sweaters with wrapping paper! Stretch your imagingation with this bendable, poppable building toy! 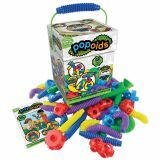 Based on the original Popoids kit launched in 1972, this quirky construction kit is quite addictive for kids of all ages. 60 piece set. Ages 3+.